When it comes to paying for health care, most people pay for and use insurance. But some are dropping their coverage or deciding to use it only for big medical expenses as deductibles and copays rise. An analysis from JP Morgan Chase & Co. shows Wisconsinites pay more in out-of-pocket costs than those in other states. "That is resulting in people not seeking the primary care they need because they can’t afford to pay those copays and deductibles. So what we want (is) to create more options," said Rep. Joe Sanfelippo, R-New Berlin. The Republican lawmaker intends to reintroduce a bill next session to legally define an arrangement where consumers pay a monthly fee to their family doctor for unlimited routine care. 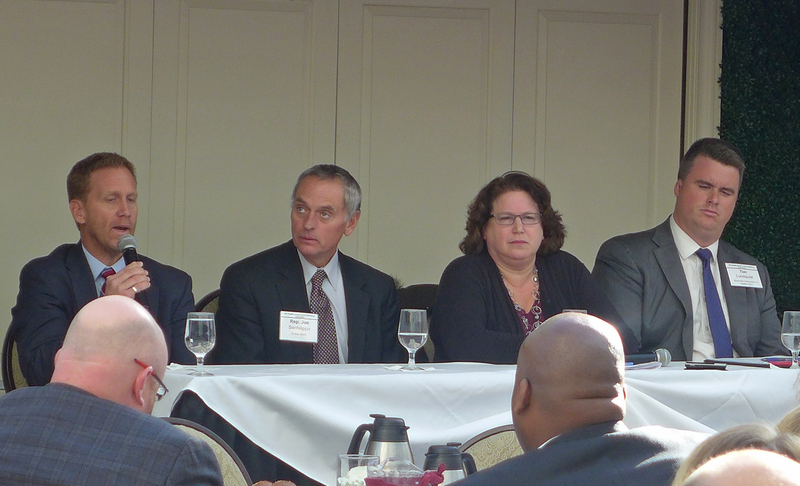 Sa﻿nfelippo was part of a Wisconsin Health News forum panel Tuesday, Nov. 13, discussing direct primary care arrangements — which are not considered insurance and should not have the same strict regulations, Sanfelippo said. Also on the panel was Donna Friedsam, health policy programs director at the University of Wisconsin-Madison Population Health Institute. She said it's unclear how many people are going without care because of high out-of-pocket costs. "A lot of the existing plans that are regulated under the Affordable Care Act are required to provide certain preventive services and most of the comprehensive policies in our state do provide pre-deductible access to office visits. There are copayments, but its still pre-deductible," Friedsam said. If successful, it’s a health care model that could shake up the market. "There is a direct fee for service need that’s spreading across Wisconsin fairly quickly. Nationally, it’s a movement that’s unstoppable," said Dr. Tim Murray, CEO of Solstice Health, which has clinics in New Berlin and Oconomowoc. Solstice Health does not accept insurance and only takes patients who pay directly for routine medical care and basic lab services. But insurance companies have concerns about people contracting with a doctor for primary care services. The consumer protections aren’t the same, and insurers argue it doesn’t make financial sense for those who have coverage. "For many individuals the math just isn’t going to work. If you purchase both a direct primary care arrangement and a comprehensive insurance plan, you’re going to be paying twice for a broad swatch of services," said Tim Lundquist, director of government and public affairs for the Wisconsin Association of Health Plans. Still, supporters consider it a way provide more access to preventive care at lower costs. "This is actually very timely just coming off an election where health care played such a prevalent role in everybody’s campaign from the governor’s race right on down to the seats for Assembly," Sanfelippo said about his bill, which didn’t pass last session. The effect of direct primary care on medical costs and patient health aren’t certain because there aren’t a lot of studies on such health care arrangements. "We don’t have good data. We don’t have any peer reviewed literature on (direct primary care arrangements) which have not been subjected to rigorous study to show cost savings," Friedsam added. "What we need to know is does access to these kinds of providers help avert other more expensive health care expenses down the line?" In addition to defining what direct primary care is, Sanfelippo proposes the state create a pilot program to use direct primary care for some Medicaid recipients and integrate it into the state employee health plan.